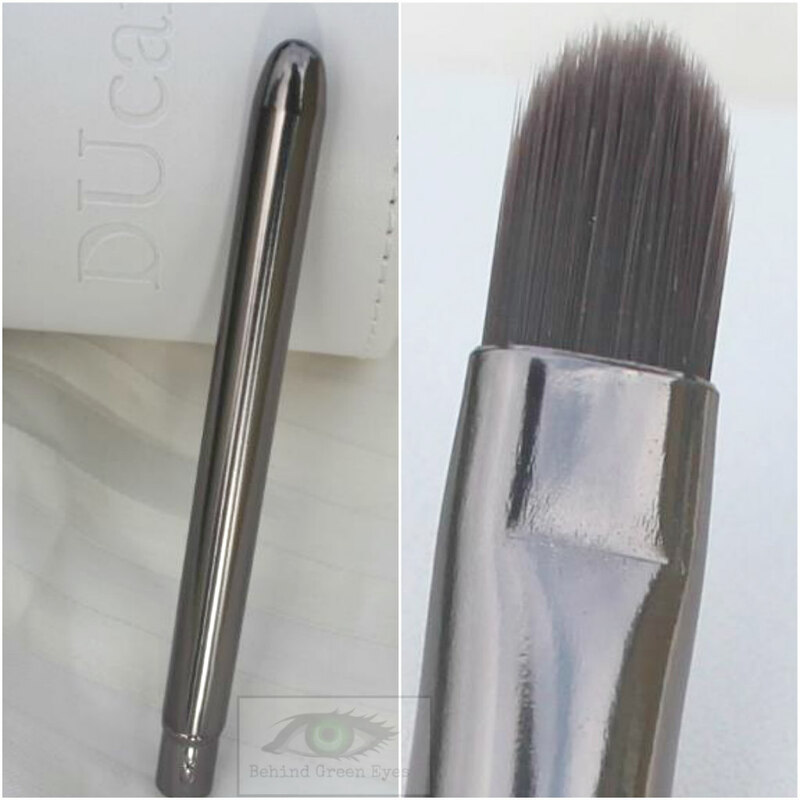 In August, I received an email from a company called DuCare, who have manufactured makeup brushes in China for over 30 years. They provide brush sets for sale on sites like Amazon, eBay, and AliExpress. I've done a post about eBay/AliExpress brushes before (here) but I'd never tried DuCare, so I accepted their offer to try the 8-piece Brush Set. The brushes arrived in a white brush roll, it's strong (it took me a few minutes to open), then that was packaged in a cardboard box so it would make a nice present. Inside, the brushes were individually wrapped in plastic pockets with a rose print. As with other brushes I've bought from China, there was a strong synthetic smell when I took the brushes out. This does go away quickly - but if you're concerned just give them a wash before use. The Jessup ones have the same smell, so you'll know what I mean if you've bought them. The 8 piece set consists of three face brushes, four eye brushes, and one retractable lip brush. The brushes are made with synthetic hair and there are a range of sets available. My favourite of these is the large powder brush - sometimes I find powder brushes too massive, this one is great for powder or bronzer. I haven't used the middle one as much, but it's a nice shape for contouring, if maybe a little large. The third one is perfect for applying face masks evenly, I don't use that type of brush to apply foundation at all but for masks - invaluable. The blending brush is great, just the right size for blending. I haven't used the flat one as much, but it looks like it'd be good for applying pigments. The angled one is brilliant, really sharp and gives great detail. The spoolie is always a handy one to have around, does the job. I've never really used lip brushes (that might change after the recent Toddlers VS Charlotte Tilbury disaster you'll have seen if you follow me on Snapchat), so I don't really have anything to compare this one to - but as with the others, it's nice, and unlike the one I have from Jessup, the cap shuts tightly which is great for keeping it clean in your bag. Overall, I really like the brushes. They're soft, they do the job, and they're pretty to look at. They're cheap too, without being cheap looking. Most of the sets are under €20, some under €10, and they're available on Amazon, AliExpress and eBay. That seller doesn't ship to Ireland, though, so you'll need to use Parcel Motel or Address Pal. What I would do, personally, is head for Ali Express - the sellers all ship to Ireland and the sets are cheaper than on Amazon, they're sold direct from DuCare. This 8 Piece Set is currently just over €16 on AliExpress with free postage. The other Sets are all available, all or most with free postage - there are other 8 Piece Sets there for under €9. I think they'd make a nice present, especially for teens who are just starting to experiment with makeup or anyone who wants to start building a brush collection but doesn't want to shell out a fortune. Nice review on this brush set! I like the look of these, I too never use lip brushes but I guess I should start…I'm terrible, Muriel.